The easiest way to earn bitcoins online for free it to actively use a bitcoin faucet. One bitcoin consists of 100 million parts called satoshis. Bitcoin faucets periodically pay from a few dozens to a few hundred satoshis for completing small tasks or watching ads. These payments are low, so don't expect to become rich fast from a faucet, but if the price of bitcoin continues to rise (and it most probably will), then even a fraction of a bitcoin may cost a lot in the future. Most of the faucets are full of ads, which makes them unpleasant to use. A lot of faucets are also shady and there's a high chance that they go out of business and run with you hard earned bitcoins. That is why it is important to choose a reputable and trusted bitcoin faucet with a clear business model, i.e. it should be clear how the faucet earns money to keep going, because if it doesn't then there's a high chance that the faucets business plan is to steal its user's money at some point. Even then there's no 100% guarantee that your money are safe, but there's never a 100% guarantee in the world of bitcoin. Mining - the faucet uses the money stored in it to expand its mining operations and mine bitcoins. Gambling - the faucet has a gambling component with a house edge, so most users that use it lose money. That is why I recommend you avoid using it unless you really know what you are doing. Log in and click the FREE BTC tab at the top. Using this feature of the faucet you can win up to $200 in bitcoins every hour by rolling a dice, so use it regularly you've got nothing to uses except for a few seconds of your time. The chance to earn the $200 prize is 1:10 000, so don't expect to win it easily, but the good thing it that you will always win at least a few dozens of satoshis (50 at the time of this writing) on each roll. When you collect 30 000 satoshis you start earning daily interest of 0.01%, which means that for every 10 000 satoshis in your balance you receive 1 additional satoshi per day. You can track your interest earnings from the EARN BTC tab. This is another great way to increase your bitcoin holdings. You can also deposit some bitcoins if you want to take advantage of the interest. However please note that when you do so, you take a risk, because the bitcoins are no longer under your control and if the website goes out of business you may lose them. The risk is small, but does exist, so take that in mind when depositing any bitcoins to websites or exchanges. For each free roll played you also receive 2 reward points. You can track your rewards points and use them to activate different bonuses from the REWARDS tab. For example, you can activate a bonus to your FREE BTC earnings for 24 hours and earn up to 10 times more satoshis per free roll. For each free roll you also receive 2 lottery tickets. They give you a chance to win a large bitcoin prize in a lottery once per week. Finally at any time you can withdraw any amount (at least 30 000 satoshis) from your FreeBitcoin balance to your wallet through the WITHDRAW button. If you are not in a hurry, choose the Slow transfer option because the transactions fee for it is much smaller. Don't forget to input your correct bitcoin wallet address (it is best to copy/paste it) because bitcoin transactions are irreversible. If you want you can also configure your withdrawal address in your profile settings to make withdrawals easier or to set automatic withdrawals every week your balance exceeds 30 000 satoshis. Last but not least, the website supports 2 factor authentication (using the Authy smartphone application), so if you want to make your account more secure, I recommend you activate it. You will then need both your password and a number generated by your smartphone to log in or to withdraw bitcoins from your FreeBitcoin balance. I recommend you stay away from the MULTIPLY BTC section of the website, unless you absolutely know what you are doing. 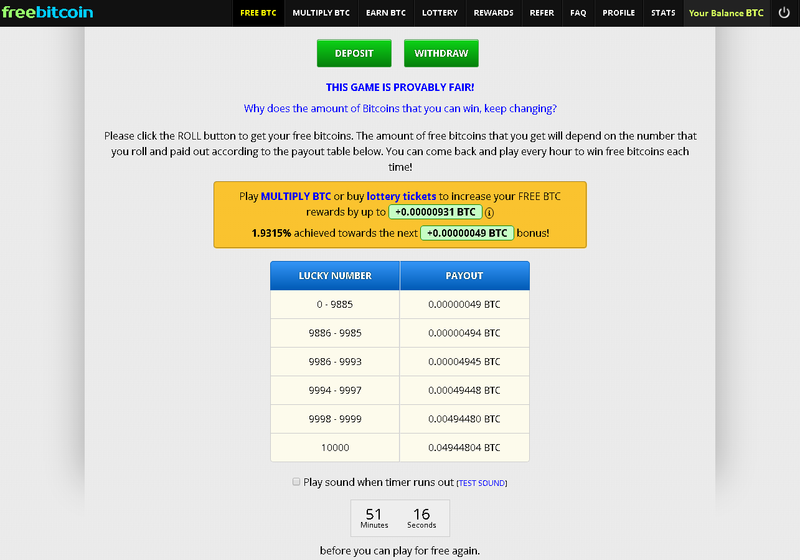 This is the gambling component of the faucet and you can easily loose your hard earned bitcoins there. That is why it is best to stick to the risk-free parts of the website - the FREE BTC for rolling a dice and always winning some parts of a bitcoin and the EARN BTC for getting interest on top of your bitcoins. You won’t earn much in the beginning, but with the ever increasing value of bitcoin even the small fractions of bitcoin you earn today may cost a fortune in the future.